Every Image at Best-Fit Bath is our original work. Nothing fancy, just photos from our happy customers. You are here: Home » Shower Remodel » Spokane bathroom gets beautiful shower makeover! Spokane bathroom gets beautiful shower makeover! 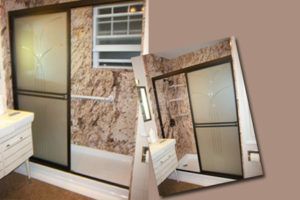 A beautiful new sliding shower door can really make a bathroom sing! This beautiful shower makeover transformed a Spokane area bathroom into a masterpiece. You can notice our focused attention to detail in the frosted glass of the shower door with curved etching, the black trim to match the dark color in the solid surface walls, and the white shower pan matching the trim on the window. We think the finished product turned out looking pretty sharp! We would be happy to show you some great options for your bathroom or shower remodel, and what trims will really make the colors in your solid surface selection stand out. Call for an appointment, or use our “Contact” form! Space challenged bathroom? Try a corner shower!